Below is a gallery of minerals for sale from the now-closed Millington Quarry in New Jersey available from John Betts - Fine Minerals in New York City, NY. Minerals found in this mineral page include: Analcime, Apophyllite, Babingtonite, Barite, Calcite, Datolite, Heulandite, Laumontite, Mesolite, Natrolite, Pectolite, Prehnite, Pyrite, Quartz (including Amethyst), Sphalerite, Stilbite. The Millington Quarry opened first in 1895 on 180-acre site in Bernards Township, Somerset County, New Jersey. The material quarried was a greenish to brown basalt that was used as aggregate in concrete for building roads and buildings in the New Jersey area and New York City. One area of the quarry was known as the State Pit because the extra-hard basalt qualified for New Jersey state contracts. The upper eastern zones had higher iron content and was brownish in color. The quarry was a family-run business for many years, but the quarrying company Tilcon, which operates quarries throughout the northeastern USA, acquired the Millington Quarry in 1999. Eventually the basalt layers were mined out and all quarrying ended in 2010 with the final excavation of a center island of stone that had supported the crusher for most of the time of operation. The quarry owners started the required remediation of the pit and imported nearly three million cubic yards of soil from 2006 through 2008 when contaminated soil was discovered and the township called a halt to the importation. In 2016 permits allowed importation of another 300,000 cubic yards of soil fill until Jan. 31, 2017 with an additional 52,000 cubic yards in approved by the planning board. The minerals occur in gas cavities disseminated throughout the basalt. These cavities provided voids for fluids to deposit minerals, mostly zeolite minerals and the associated late-forming minerals. The quarry is known for datolite, prehnite analcime crystals. Most importantly, the Millington Quarry produced the best-of-species crystallized pectolite specimens. The best pectolite specimens were found in the early 1990s in the State Pit and had remarkable pink color on the terminations. I sold many pink pectolite specimens to mineral museums including Harvard University. Collecting was allowed for several mineral clubs, notably the Morris Museum Mineralogical Society (MMMS). For many years the MMMS had sole permission for field trips and usually conducted day-long trips in Spring and Autumn. Many local mineral collectors maintained MMMS memberships primarily to participate in the field trips. At these trips collectors were allowed to drive their automobiles into the quarry, which allowed collectors to easily take home large specimens. In later years, when many other clubs were participating at the same time, automobiles were parked in the upper parking area near the quarry offices and were bused down to the collecting areas. Besides club collecting, a few local NJ residents were able to obtain permission to collect in the quarry, and they became major sources of minerals for local zeolite mineral collectors. 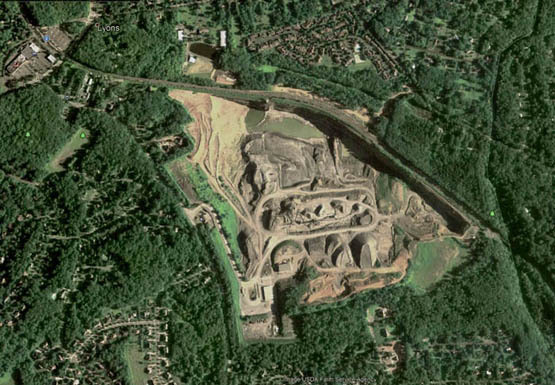 2006 aerial photograph showing the quarry in the later years of operation. Further expansion was limited by the commuter railroad line along the northeast edge and the residential homes to the south and west. The crusher plant is in the center of the quarry on an "island" of basalt which was the last portion to be quarried in the final years. 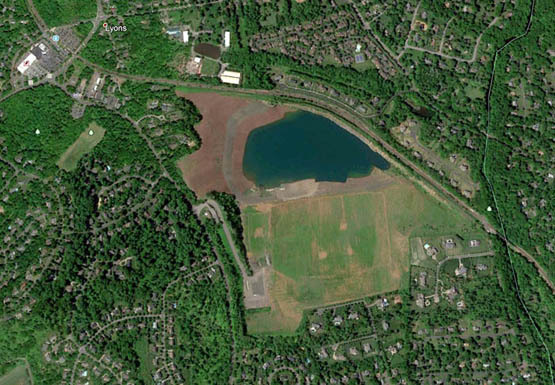 2018 aerial photograph showing the quarry in after the site was remediated. The current owners have proposed redeveloping the site, but local residents would prefer open parks. Currently development is at a standstill. In the upper left corner of both photos is the Lyons station for the commuter railroad. The Millington Quarry is now closed forever. collected in the heyday on the 1990s to early 2000s. All minerals listed below are available for sale.